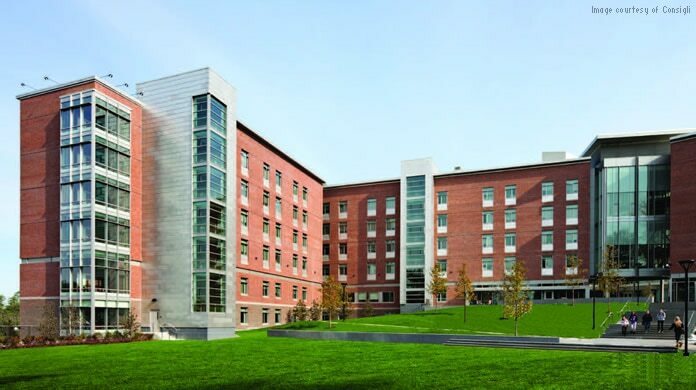 Consigli Construction used Building Information Modeling (BIM) to coordinate construction of a new 125,000-square-foot, 410-bed residence hall without impacting the university admission schedule. Autodesk BIM solutions helped Consigli prevent delays and costly construction problems—and enabled them to complete the project on schedule and half a percent under budget. By using BIM to create 3D models and explore design options, Consigli was able to solve space challenges, and analyze materials and construction techniques to identify more cost-efficient structural systems. Consigli created a model of the whole building site to develop synchronized construction sequencing, coordinate materials delivery, and minimize weather-related delays. The team used the model to systematically identify and resolve interferences floor by floor—an effort that paid off in a big way. During construction, only one significant clash surfaced. It was easily fixed. Consigli used BIM 360 Field cloud-based construction field management software to review the project on-site and generate punch lists. Punch lists were documented with photos and linked to issues to boost efficiency in the field.